The late night host gets to the bottom of how one Irish family's kitchen was upended by a visiting bat. Kitchens are always a place for sharing—food, culture, knowledge, laughs. For one Irish family, a few rather chaotic minutes turned their kitchen into a place to share some harrowing moments after a bat found its way into their home. The video, which was posted this past Tuesday to Facebook, opens with a "Bat Dad" title card before we see the family scrambling to catch the bat with nothing but some kitchen table chairs and a towel. As you watch, you can see the father, Derry, haphazardly and hysterically attempt to catch the bat whirling around their kitchen as his wife, Maureen, hides behind a door to the kitchen, face pressed to the glass. At one point, the family dog, Basil, is even caught relieving himself in the kitchen, further adding to the commotion. The entire incident is captured by the Flemings' son, Tadhg, who you can hear enthusiastically expressing fear over the flitting bat. Since publishing the video, the Fleming's, a family from the Kerry, Ireland area have seen their video rack up over 2 million views. 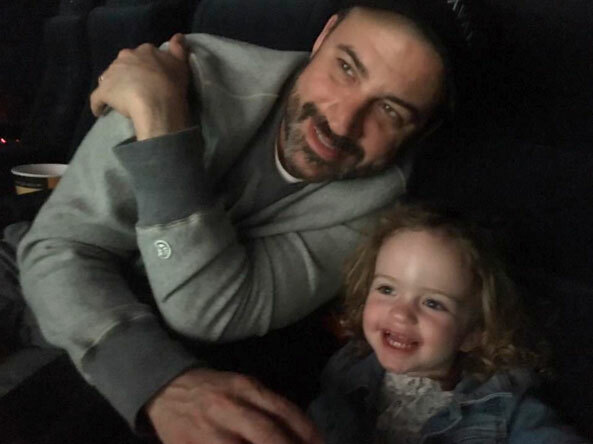 Last night, Jimmy Kimmel featured the latest family to see their captured shenanigans go viral on his show. In the video below, you can watch Kimmel discuss this family's heroic efforts, including who let the bat in and whether they've since gotten their rabies shots, before getting the Fleming family version of an Irish jig. During the five-minute segment, the late night host and Flemings break down exactly what happened on that fateful day. According to Tadhg, the ordeal was not the first time they'd had a flying animal in their home. "[It was] the first time we've had a bat, yes," Tadhg told Kimmel. "But last year we had a robin in the sitting room … Batman and Robin, it just makes sense."